If you've still got some corned beef in your fridge leftover from last week, I've got a great recipe for you! Best Corned Beef Hash is a dish I've been making for years. One of those recipes you don't think to write down. One of those recipes you just make. Well, today I'm going to share it with you! I'm not sure what my family enjoys more. 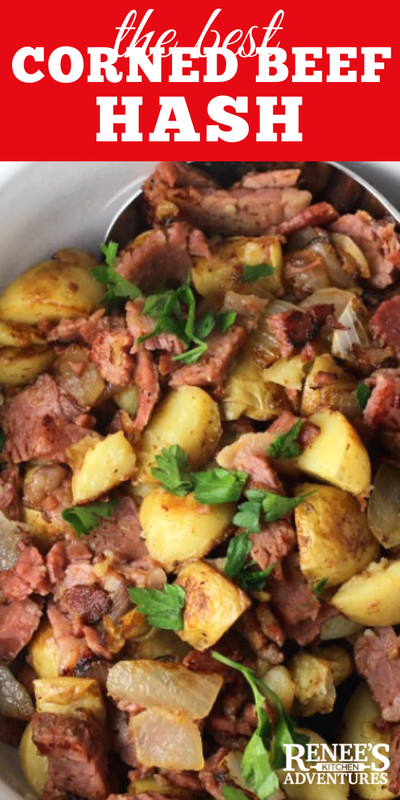 The actual corned beef and cabbage dinner or all the yummy recipes I make with the leftovers. To ensure plenty of leftovers, I always make several corned beef briskets at one time. That way we can eat it for days afterward! 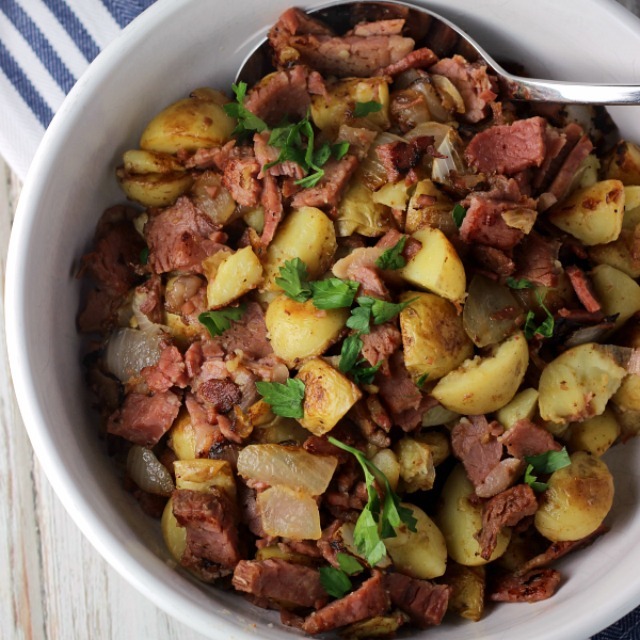 One recipe that always makes our table post St. Patrick's Day is this easy-to-make Best Corned Beef Hash recipe. My family enjoys corned beef hash so much that they are willing to eat the stuff in the can! Not that there's anything wrong with that, but fresh corned beef hash is just SO MUCH BETTER! 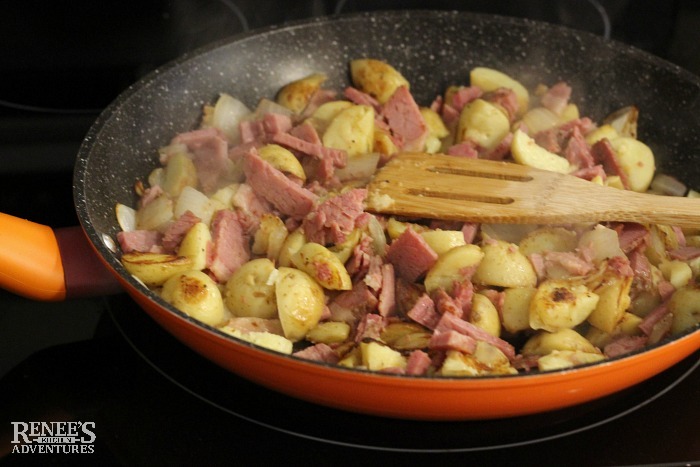 I almost always cook the potatoes for the corned beef and cabbage dinner separate. I do it for a couple of reasons. First, I can control the firmness of the potatoes when I cook them separate. Potatoes can quickly become really mushy when cooked in the pot with everything else. Second, I'm not that fond of the cabbage taste potatoes tend to get when cooked with the beef, carrots and cabbage. Cooking them separately leaves them tasting like potatoes and only potatoes. 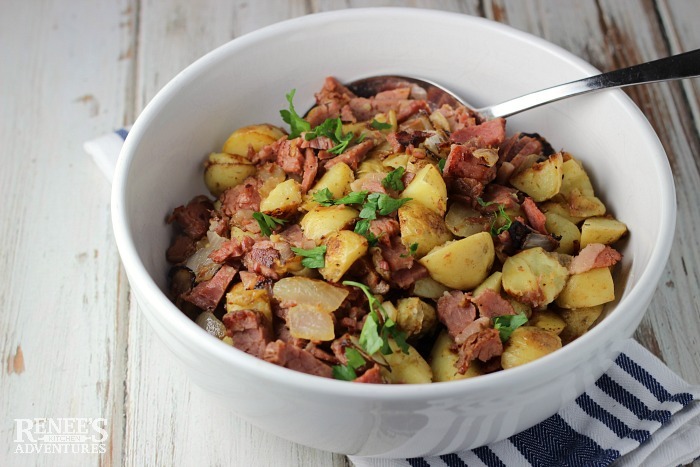 And lastly, I can make enough to have leftovers to put in the fridge to make this delicious corned beef hash dish! If you don't have any potatoes leftover, no worries. You can quick microwave some petite potatoes to use in the hash. Just make sure you at least cool them to room temperature before using them in this recipe. If you can make them ahead of time and refrigerate them, even better. Cold, cooked potatoes tend to fry up much better than warm ones. There's probably some scientific reason why this is true...but I don't know what that reason is. We always top our Best Corned Beef Hash with some runny yolk eggs! The egg yolks mix in with the hash and creates a delicious sauce! My son also uses ample amounts of hot sauce on his hash. YUM! This hash makes a great breakfast, lunch, or dinner! No leftover corned beef? You can substitute thick sliced deli corned beef for the leftover corned beef with good results. For best results, start with the best beef! Certified Angus Beef® brand always delivers on taste and quality when I'm cooking beef. 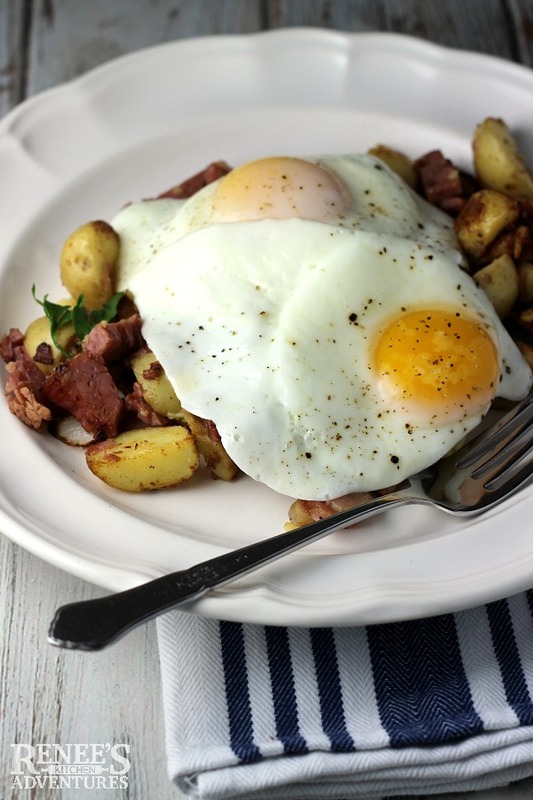 Leftover corned beef is transformed into a simple hash with onions and potatoes and topped with eggs if you like! Heat large skillet over med high heat. Add oil then butter. When butter starts to bubble, add in onion and cook for about 2 -3 minutes, or until it starts to become translucent. Add in garlic and cook for one minute. Add in potato. Press down and allow to brown on one side, about 7 - 8 minutes. Stir. and continue to heat until browned and warmed through. Add in corned beef and stir. Cook for another 2 minutes or so until the corned beef is heated through. Take off heat and add parsley and salt and pepper, to taste. Top with cooked eggs if desired. 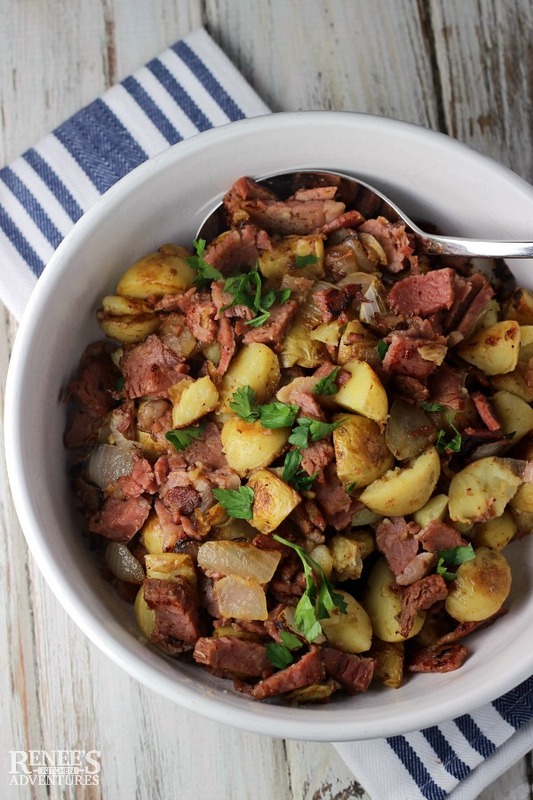 Don't forget to pin the best Corned Beef Hash to your Pinterest boards! Love BEEF? Join the Certified Angus Beef ® Kitchen on Facebook where you'll find expert tips, advice, recipes and more in a beef loving community made just for you! I am an ambassador for Certified Angus Beef ® brand. I am being compensated for my work with them. I was not required to write this blog post, but chose to do so. All opinions are mine alone. I used their recipe with permission.